Climate change and global warming have been blamed for a lot of things, but one possible link between warming sea water and food-borne illnesses could be awfully depressing to folks who enjoy chowing down on raw oysters. We all know you can get a pretty nasty bout of the pukes from eating a bad oyster. It often comes from a little bugger with the alphabet soup name of Vibrio parahaemolyticus (you can call him Vp for short), a bacterium, related to cholera, that lives in brackish coastal saltwater and loves warmer temperatures. 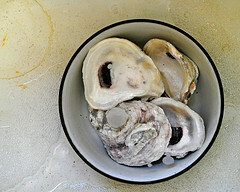 Vp is one of the reasons that some oyster fans only slurp on their favorite food during the colder months of the year. Cold water means less of a chance you’ll be a sweaty, vomiting mess for three days. But while the rate of illnesses tied to other common food-borne pathogens like listeria and salmonella have remained relatively flat, the CDC says that there was a 43% increase in those illnesses related to Vp over the last five to six years. And since Vp infections are often confused with other food-borne illnesses, are rarely fatal, and generally require no treatment other than staying hydrated for a few days, it’s hard to tie down the exact number of cases. The CDC estimates that for every one known case of VP-related illness, there are 142 instances that go undiagnosed. Compare that with the 1:29 ratio for salmonella or the 1:2 ratio for listeria. As this article from Modern Farmer points out, oyster farmers in Alaska, who had not previously had to be concerned with warmer waters and Vp, are now sinking their oyster cages to new depths to insure their oysters are growing in water temperatures below 59 degrees Fahrenheit. This change was made after 62 people on board a cruise ship in the area got ill from Vp after eating oysters from local waters.